Published: Aug. 20, 2009 at 01:28 a.m.
FLOWERY BRANCH -- The offensive formation was already "strong" right, as tight end Tony Gonzalez's presence at the end of the right side of the offensive line indicates. A receiver is split right. As another receiver goes in motion, Falcons quarterback Matt Ryan recognizes right away that Gonzalez will be matched up with an outside linebacker. That's like trying to catch a fly with a hula hoop. Ryan takes the snap and waits -- not long -- for the taller, quicker Gonzalez to bust a short post move on the overmatched outside 'backer before dropping a floater into his hands in the corner of the end zone. Scoring won't be a problem for Atlanta this season, with Gonzalez added to a robust tool box filled with Michael Turner, Jerious Norwood, Roddy White, Michael Jenkins and an offensive line that is shaping into a fairly imposing unit. 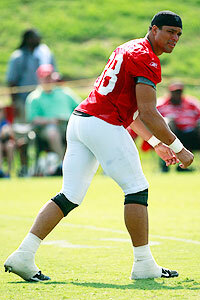 Tony Gonzalez makes an already potent Falcons offense all that much more explosive. Even so, the Falcons don't want to be the Saints -- reliant on the offense, because of a suspect defense. That's how things might be for awhile, though. The decision to release or not re-sign five veteran defensive starters has created vulnerabilities, especially in the secondary, that will take time to fill. "The thing with our defense is we're very, very young," said head coach Mike Smith, a former defensive coordinator, who still oversees that side of the ball. "We're faster than we were last year but we've got a lot to do in terms of learning our schemes. We have nine guys with four years or less experience. Our corners (Chris Houston and Brent Grimes) have three years or less. One safety (Thomas DeCoud) is in his second year. Our starting middle linebacker (Curtis Lofton) is in his second year. We could be starting a rookie at defensive tackle (Peria Jerry). "It's going to be a young, challenging season for us early on." Atlanta doesn't have any time for a learning curve, opening its season with Miami, Carolina and New England. Their first three games last season were Detroit, Tampa Bay and Kansas City. They started 2-1 and might feel fortunate to open that way this season. There will be no mercy, but one thing we learned last season, when the defense was serviceable at best, Smith and defensive coordinator Brian VanGorder can devise schemes to hide blemishes. They've been working extra hard to figure out what to do already. They're just fortunate that the offense should buy them some time. » One of the bigger changes in the Falcons' offense, besides the expansion of a playbook that was marginally curtailed last season because Ryan was a rookie, is a re-tooling of the red zone offense. Gonzalez has prompted a change in passing schemes inside. White said once the team gets into scoring range, there are an abundance of plays designed for Gonzalez. Fewer balls have come his way because of Gonzalez's presence, White said. » The Falcons did not have a presence at tight end in the passing game last season and that limited what they did at times, White noted. That's changed. And just because an abundance of balls aren't coming his or Michael Jenkins' way in the red zone at the moment, White said he expects that to change once the Falcons get into regular season. » Right guard Harvey Dahl could become a household name, at least as far as guards go. The third-year player and former practice squad member is one of the nastiest players in the league and has admitted to being a not-so-nice person (in saltier terms). He replaced Kynan Forney (who was cut) as the starter last season and is the most physical player on the offensive line. » Defensive end Jamaal Anderson's time as a starter could be coming to an end. The former No. 8 overall selection is simply not producing, getting just two sacks in 31 starts and not providing much pressure as a whole. He does not consistently come off the ball quickly or aggressively and has yet to make himself worthy of being double-teamed, a team source said. Fifth-year player Chauncey Davis, primarily a run stuffer, showed better pass-rush skills last season and through training camp and he could eventually become the starter. The Falcons have moved Anderson to defensive tackle at times, hoping to get something out of him. » The loss of slot receiver Harry Douglas to a torn ACL has left the No. 3 wide receiver spot open. The void is being filled by veteran Brian Finneran, a reliable threat on third down, but veteran Marty Booker could eventually fill the spot. Atlanta signed Booker after Douglas went down early in training camp. Grimes looks to have regained his starting job at left cornerback, although he is going to be pushed by rookie Chris Owens. Both are 5-foot-10, 185 pounds or smaller and are susceptible to bigger receivers. Grimes has been injury prone. Owens has shown, in the early going, to be more physical against the run. When Douglas blew out his knee, the Falcons also lost their punt returner. In steps Eric Weems, a third-year player from Bethune-Cookman, who made the practice squad as an undrafted rookie in 2007 and played in six games last season. The tireless worker has shown good hands, decision-making and shiftiness. The competition isn't officially over, but Weems clearly is the leader of the pack. Jerry is coming along nicely but at 6-2, 290, he is going to have to be spelled in a rotation that could include Thomas Johnson and Trey Lewis or Jason Jefferson. Jerry is playing nose tackle in the 4-3 front and is showing well, especially in passing situations. However, Johnson started the preseason opener and played well. Second-round pick, safety William Moore, was expected to challenge for a starting role, but he had arthroscopic surgery on his left knee and likely won't be ready until the end of the preseason/early regular season. "The most important thing I have to do is to make sure he's on the bus." -- Tight ends coach Chris Scelfo, joking about the 'tough' job he has coaching Gonzalez. While interviewing outside linebacker/special teams captain Coy Wire for our On The Fringe series, tailback Michael Turner came bursting out of the weight room screaming, "We love you Coy! We love you Coy!" The gesture was a striking departure from the relatively soft-spoken Turner, who rarely shows much emotion. Free-agent acquisition Mike Peterson is the clear leader of the defense. The former Jacksonville linebacker played under Smith with the Jaguars and replaces Michael Boley, who signed a free-agent contract with the Giants. ... The battle for the backup quarterback job is more open than initially thought. Veteran Chris Redman entered training camp as the No. 2 but a team source said that D.J. Shockley could challenge for the spot. ... The Falcons could keep four tailbacks, with Thomas Brown and Jason Snelling backing up Turner and Norwood. Brown has practice squad eligibility, but the Falcons feel he could be claimed if they try to stash him. Snelling, who was the No. 3 tailback last season, can play tailback in a pinch.